Each year AAUW-PA offers grants to attend NCCWSL. We are pleased to announce the winners of the 2018 grants. Gillian Williams is a Pennsylvania native who is a Junior Public Policy major with minors in Political Science and Organizational and Community Leadership at the University of Delaware. She is an active member of the Blue Hen Leadership Program and currently a Tier 3 student working with AAUW Newark, DE on a social innovation project. She was the founding President of AAUW at UD and manages an executive board of 4 and 20-30 consistent general student members. Last spring, she joined the Biden Institute’s Make It Count campaign, a student-run, nonpartisan student civic engagement campaign. “My experience at The National Conference for College Women Student Leaders (NCCWSL) was perspective shifting, motivating, and incredibly inspiring. I have never met so many intelligent, woke, powerful women leaders all under the same roof. At the conference, I attended workshops and panel discussions: Women of Color Allies; Building Your Legacy: Creating a Career of Impact; I AM 2018: Young Women, Making a Difference through Power Mapping; Elect Her from Running Start: Bringing Young Women to Politics; Is America’s Health Care System Failing Women; and All About Law. This is only the beginning of a lifelong dedication to gender equity and I have a lot to learn about allyship and intersectionality. Throughout the learning process, it’s important to focus on progress over perfection. I learned during the conference that women’s careers are not a ladder, they are a beautiful mosaic. Sometimes you can’t understand the beauty until you back away and see how all of the parts fit beautifully together. I will never forget meeting Kim Churches and exchanging business cards on the last day of the conference – what a perfect way to end an incredible weekend. The exciting National Conference for College Women Student Leaders (NCCWSL), held at the University of Maryland at the end of May or beginning of June each year brings together college women from all over the US to learn about leadership. The AAUW-PA Student Advisory Council (SAC) serves from October – May each year. The members of the AAUW-PA Student Advisory Council (SAC) serve as AAUW ambassadors and lead gender equality projects on their campuses. The SAC also advises the AAUW-PA State Board on the needs of college students. In 2018-19 we are making some exciting enhancements to the SAC. In order to create a more active way for the SAC members to advise the PA State Board we will have a SAC member on a rotating bases participate in AAUW-PA board meetings. As reported in the May 2018 Keystoner the AAUW-PA board of directors has decided to go to a one state meeting per year format. 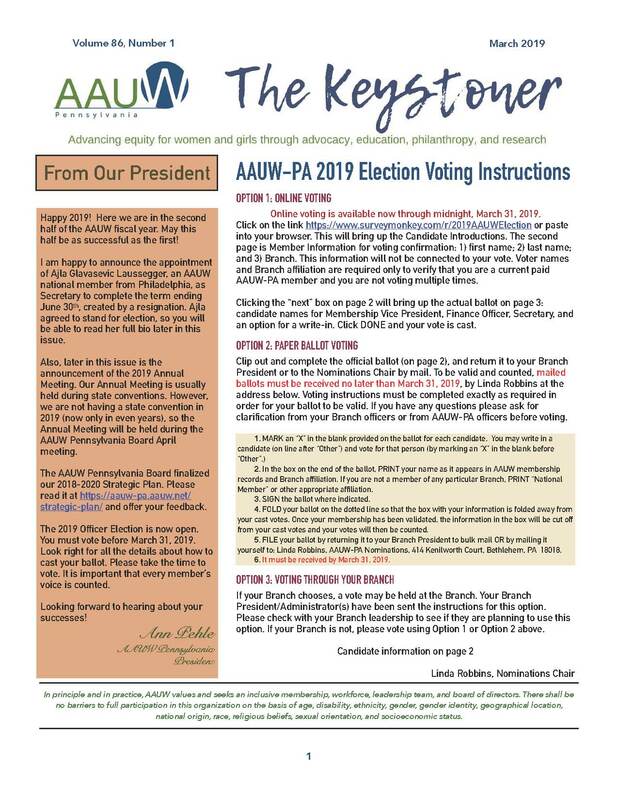 In the new model AAUW-PA Conventions would occur in April in even-numbered years and the Summer Retreat would occur in July in odd-numbered years. The AAUW-PA board of directors at the July 2018 Board meeting saw this as an opportunity to engage the SAC and create greater opportunity for the SAC to advise the AAUW-PA State Board on the needs and interests of college students. In the odd number years the SAC will attend the AAUW-PA State April board meeting. In order to create leadership skills for the entire SAC, the April 2019 board meeting will also serve as a platform for the SAC members to present to the board, attend the board meeting and have some programing specific to the SAC. SAC members will attend these leadership annual meetings as a guest of the state. In even-number years the SAC members will plan and deliver appropriate sections of AAUW-PA’s Annual State Meeting in April, and have programming specific to students. At the end of the term, SAC members provide a short narrative report on the successes and challenges of their SAC experiences. The SAC will consist of at least one member from each of the three state districts (East, West, Central), plus up to two more, for a maximum of five. Members will serve for one academic year, approximately October through May. Students must be undergraduates in any year (first-year through senior) enrolled full-time in either a two- or four-year accredited College/University (C/U) AAUW Partner member school in Pennsylvania (check whether your school is a partner). Members of AAUW Student Organizations will be given preference, but any undergraduate student at a C/U partner is welcome to apply. Personal affiliation with AAUW is required on appointment. THANK YOU to the 2017-18 Student Advisory Council members: Bria Bowman from West Chester University, Natalia Hazelwood from Penn State University World Campus, Shaina Hilsey from California University of Pennsylvania, Sofino Odero from Dickinson College.